I love Saturdays. This was a good week/bad week. DS & I had a nice visit with my parents, and got our yearly eye exams done. New contacts and new sunglasses for us both. I went to the LQS, bought some more colors of thread to have on hand for stitching bindings. Ya never know what color you might need and not have it on hand. And for me, it’s about an hour drive to get more. My roll of batting and batting samples came from Quilter’s Dream. I have decided to place a fairly large order of assorted packaged battings, and keep a stock of them in our store front at the glass shop. There are several quilters here, and no place to buy good batting here in town. I think it might be a good thing to do. I did email them for a “suggested retail” list, but have not heard back from them. Michelle W. gave some pricing advice in a post I have on MQR, and I really like the way she does it, but just wondered if they have any guidelines. I did complete a customer lap quilt. Beautiful fabrics. I got so lucky on this one. Once, I noticed that my thread was not threaded over the check spring. My heart sank…I did not want to look at the stitches on the underside of the quilt. They were perfect! Then about 2 rows later, a piece of my check spring plopped down on the quilt top. Oh joy, I thought! When that happened to me with my premier, I had to frog a whole 80-something inch row of Linda Taylor’s Feather Meander panto. Not fun! I finished stitching the row, as I was close to the end, and guess what! It did not mess up the tension! How lucky was that?! The bad week part, is that whatever it is that ails me, which I think is fibromyalgia, is really flaring up this week. I have been so tired, and I hurt, hurt, hurt. My shoulder, my right arm, right hand, legs, hips…whine, whine, whine. I called in sick yesterday, and stayed in bed extra long. My hand & wrist haven’t felt this bad before. My palm is very sore to put pressure on. Typing doesn’t really hurt, but using my mouse does, and if I try to twist off a lid, or lift something, OUCH! Oh, another good thing…my new furniture arrived. Karen K. wanted me to post pics, so here it is. I love it. Now I am going to so do some sewing. Have a great day! 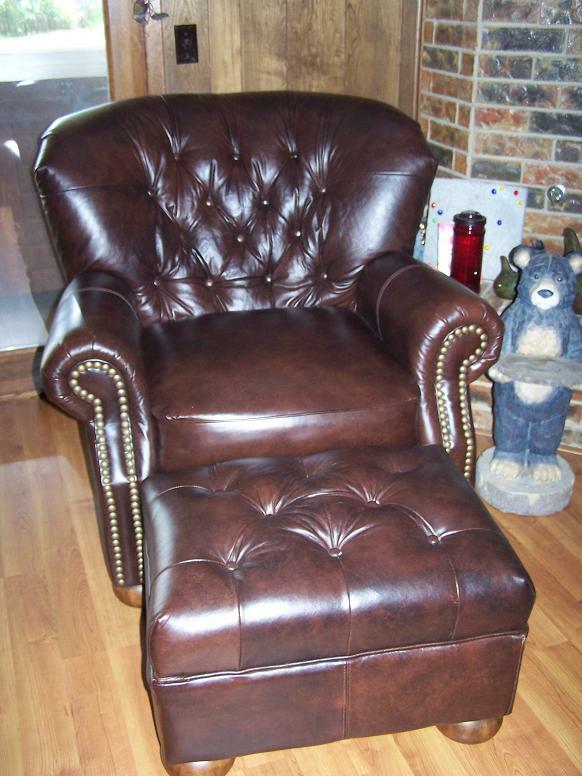 Randi – thank you so much for posting the pics of your leather furniture. I love it! Right now all living room and den furniture is in the POD while house renovation being done. I just don’t think I can let that stuff back in the house – I’m going to have POD sale and then go shopping for leather! I love that furniture!!! And the quilt is beautiful too!!! Glad the check spring didn’t cause you too much frog time. That wouldn’t have been fun with hand pain espeacially!!! Hope it all settles back down fast. Randi, love the quilt! very nice job! And I hope you are feeling better PDQ. As for Quilters Dream battings…what I do is double the wholesale price. I don’t add my shipping costs..just the double the base price. I also double the wholesale cost of the QD Batting. You should ask your doctor to run blood tests for fibro-the tests can’t tell you if you have it but they can rule out other stuff like arthritis. Good luck and I hope you feel better. I am sorry you are not feeling well. Love the quilt pics. Where is the pic of you in your new sunglasses? sorry to hear that you are hurting ~ nothing worse than when the body aches! 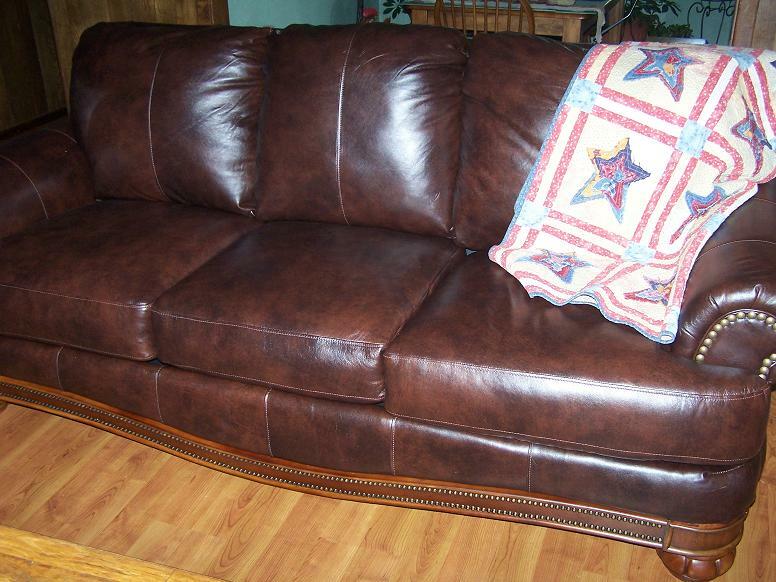 Love the Blue and White quilt and your new furniture ~ I just LOVE leather furniture! Yeah, where is the pic of you in your new sunglasses????? And yes, you *are* lucky with the tension spring…. I’m thinking your machine is in love with you. I’d also like to see a photo of you & ds in your spiffy new sunglasses. Are you in an area that has had rain the past week? My arthritis is always worse when it rains. Your new chair looks inviting though and may be a helpful cure. 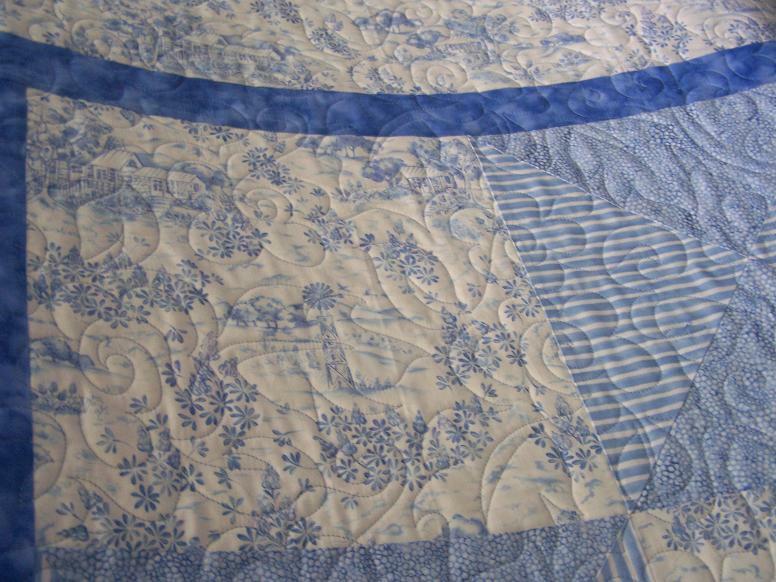 Love the blue quilt. My that chair looks so sumptous! I wanna curl up in it!!! Randi, hope you are feeling better now. The new furniture looks very comfy and nice. Beautiful quilt! Hope you are feeling better — hey your countdown shows 4 blocks ahead of schedule! Cool! 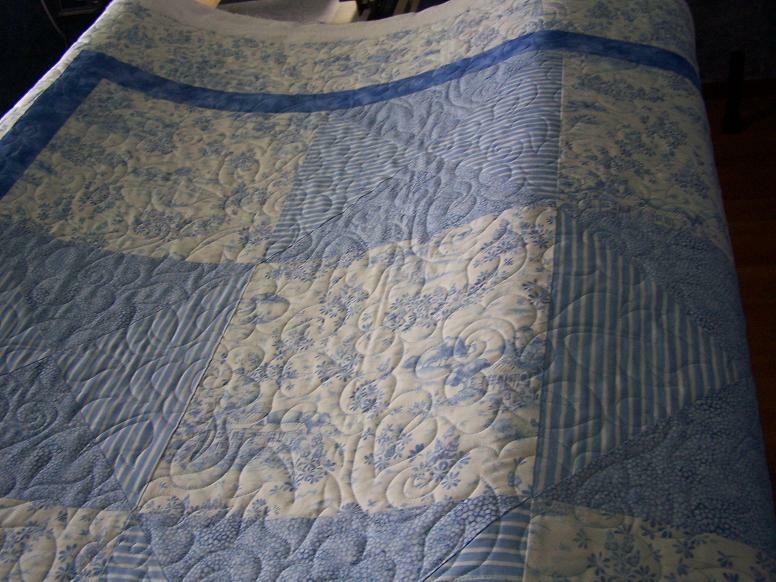 I love blue quilts, they seem so calming to me. I’m sorry you are hurting, I hope it eases up soon! For my Fibro pain, taking Mucinex, one tablet twice daily REALLY helps me feel human and flexible. I was able to do a highly physical job for the last 17 yrs due to the Mucinex regimine. I *strongly* recommend this to all quilters that have Fibro. Hope it works for you too. I have some Mucinex in the cabinet. I’ll try that…thanks, Betty.